Men and women tackle the issue of energy efficiency around the house in a completely different manner, data from an online poll commissioned by UK energy saving expert Zenith Home has been able to reveal. The survey of 500 UK adults found that 64% of women confessed to taking long “luxurious” showers on a regular basis compared to only 17% of men. Furthermore, 78% of female respondents said they would gladly nudge up the heating without their partners knowing. That’s compared to only 14% of their male counterparts who said they would turn up the thermostat without telling their other halves. When it comes to turning the lights off, ladies win the debate with 78% of women saying they are committed to switching it off before leaving the house. A mere 38% of males remember to do it. Half of the men surveyed chose energy efficient home improvements as one of their top three choices when it comes to splashing the cash. In fact energy efficiency is higher on men’s list of priorities compared to women, the poll revealed. If you’re looking for a sure-fire solution designed to slash energy spending by controlling each radiator in your house separately, then the HeatSave thermostatic radiator valves are the perfect tools for this job. The HeatSave thermostatic radiator valves are the easiest to install and most cost-effective and efficient energy management products on the market. They are particularly suitable for retrofitting, since one simply has to remove the existing TRV and replace it with the HeatSave unit. 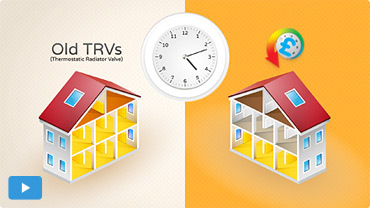 Remotely controlled via an easily-accessible web interface, the HeatSave valves enable users to achieve impressive savings, slashing one’s heating bills by up to 30%, especially when coupled with the HeatingSave Building Energy Management System.